Join us on Tuesday, May 21, 2019 at The Edison Club for our Annual Golf Tournament! 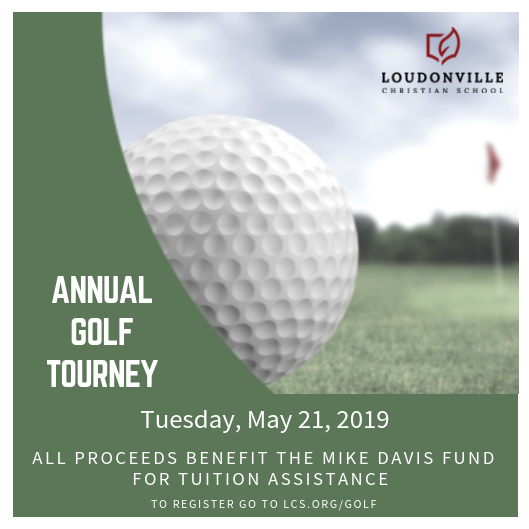 We will have a great day of golf and help support the Mike Davis Memorial Fund for Tuition Assistance. Last year's tournament raised over $14,000 and blessed many families! On January 8, 2008, the Loudonville Christian School community lost a special friend with the passing of Mike Davis. He was one of the “faces of the school” as each day he greeted the students with a smile and a high five as they entered the building. The Mike Davis Memorial Fund for Tuition Assistance (MDMFTA) was established to honor the passion shown by Mike for the mission of the school and the lives of the individual students. The objective of the MDMFTA is to provide tuition assistance to Christian parents whose desire is for their children to receive an education committed to high scholastic standards and an evangelical view of God and the world, but who are facing tough economic challenges.